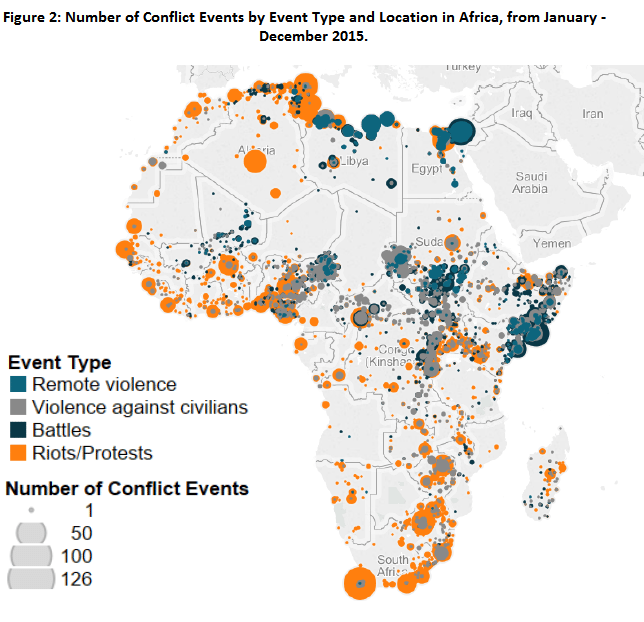 In 2015, ACLED recorded 14,640 conflict events on the African continent. Armed conflict decreased by 14.0% compared to the previous year, marking the first negative trend since 2009. In a number of high-activity countries, including Central African Republic, Kenya, Democratic Republic of Congo and Somalia, conflict levels declined by more than 20% over one year. However, Figure 1 shows that such trends were not homogenous across the continent, and that as many as 15 African states witnessed an overall increase in political violence. The escalation was most significant in Burundi, where the number of conflict events increased by more than four times the levels of 2014, but also involved medium- and high-activity countries such as Niger, Egypt and Mali. For the second consecutive year, Somalia (19.4) and Libya (15.3) showed the highest incidence of armed conflict events per 100,000 population (World Bank, 2016) against an average African rate of 1.2. The number of conflict-related fatalities in the previous year also dwindled by 10.6%, declining from 39,391 in 2014 to 35,220 in 2015. The geographical distribution of fatalities illustrates that the decrease was highest in Central African Republic, Uganda, Madagascar and South Sudan, whereas Egypt, Chad, Burundi and Niger saw a dramatic increase in conflict mortality. Libya had the highest incidence of fatalities per 100,000 population (43.2) shortly followed by Somalia (38.9) and South Sudan (26.5), reflecting the enduring lethality of ongoing conflicts. The average fatality rate for African countries in 2015 stood at 3.4. With regard to the types of political violence recorded by ACLED, riots and protests accounted for 39.7% of total conflict events, rising by almost 10.0% compared to the previous year (see Figure 2). Rioting and protesting increased significantly in more than half of African countries, revealing that popular demonstrations and domestic unrest pose a major challenge to a growing number of governments across the continent. Discontent with the current socio-political situation and fierce electoral competitions were key drivers of protest in South Africa (ACLED Crisis Blog, 11 December 2015), Tunisia (ACLED Crisis Blog, 4 September 2015) and Uganda (ACLED Crisis Blog, 5 November 2015), whereas President Nkurunziza’s successful bid for a third term in office generated violent clashes between opposition groups and police forces in Burundi (ACLED Crisis Blog, 9 October 2015). Battles between armed groups made up 27.6% of all conflict events and more than half of total related fatalities: despite a relative annual decrease, battles still featured prominently in Africa’s conflict landscape (see Figure 2). However, significant regional differences exist among high-violence states. In northern Africa, armed Islamist groups linked to the Islamic State and Al Qaeda were able to establish a regular presence in the Libyan cities of Derna and Sirte and to launch large-scale attacks against Tunisian and Egyptian military forces, thus consolidating their outreach across the region (ACLED Crisis Blog, 4 September 2015). Mali saw a resurgence of conflict in 2015, as Tuareg insurgents and Islamist groups intensified their attacks against state forces and UN troops in the north of the country (ACLED Crisis Blog, 10 July 2015). In central Africa, Boko Haram extended its regional presence to Chad and Niger, while DRC, Sudan and South Sudan remain major conflict hotspots. Further east, in the Horn, Somalia witnessed the highest number of battles in Africa, with 1,296 events recorded in 2015. Civilian involvement in conflict also constitutes a critical and recurring element of contemporary African warfare. In 2015, violence against civilians represented 24.3% of total conflict events in Africa, with a 17.9% decrease compared to the previous year (see Figure 2). Civilian targeting declined markedly in several high-activity states such as Central African Republic, Kenya, Libya, Democratic Republic of Congo and Somalia, and witnessed a significant increase only in a small number of countries including Burundi (with 103 more episodes and three times the levels than in 2014), Cameroon and Egypt. These trends notwithstanding, ACLED recorded 12,466 civilian fatalities in 2015, which accounted for 35.4% of reported conflict deaths and represented the highest proportion since 2008. Civilian population suffered the most deaths in Nigeria, corresponding to more than half of total civilian fatalities in Africa (see Figure 3). Additionally, Burundi, Chad, Tunisia and Egypt witnessed the highest increase in the number of civilian fatalities, which rose by between three and fifteen times over the year. Political militias carried out 46.3% of total attacks on civilians across the continent, although their incidence declined by around 8% as a result of the re-categorization of Boko Haram into a rebel group, following a change in its aims and goals. Within this set of actors, pro-government militias played a crucial role in perpetrating violence against civilians in association with, or at the behest of, state agents (Kishi and Raleigh, 2015). In some contexts, state agents themselves continue to represent a major threat for civilians, like the military forces of South Sudan who targeted and killed as many civilians as no other group active in the country in 2015. Armed Islamist groups were also among the most lethal perpetrators of civilian violence. 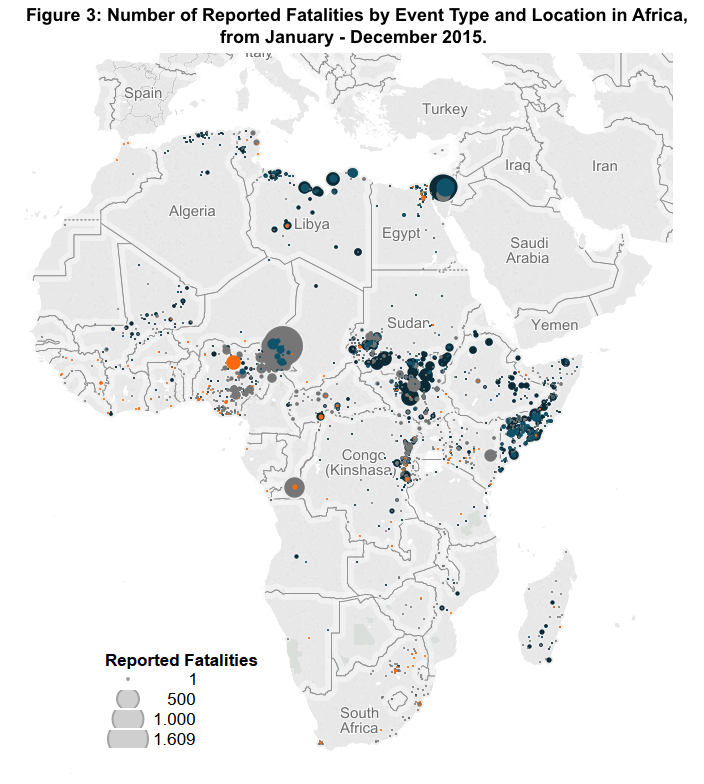 Boko Haram, Al Shaabab, the Egypt-based State of Sinai and the offshoots of the Islamic State in Libya and Tunisia were responsible for more than half of all violence against civilians in Africa, pointing to the increased operational capacity of these groups (ACLED Crisis Blog, 11 December 2015; ACLED Crisis Blog, 4 September 2015). 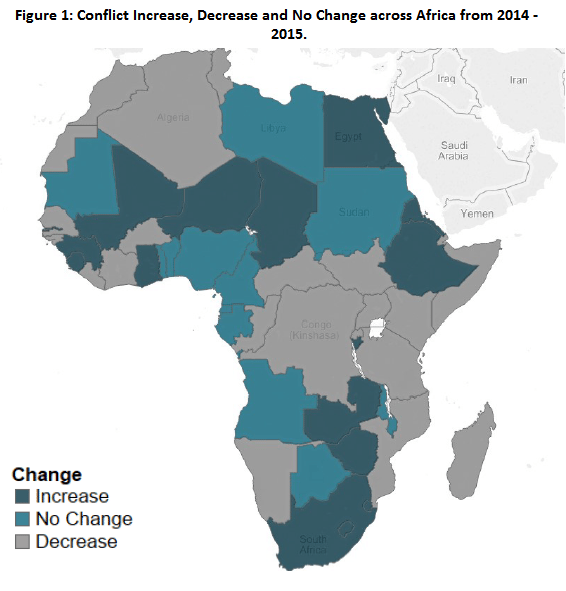 These findings illustrate the complex and changing patterns of conflict across the continent: while overall political violence seem to decrease in 2015, civil wars, armed insurgencies and violence against civilians remain a major source of conflict and instability.